Phoebe Rothschild has always felt average in her remarkable family, but she takes comfort in her best friend Mallory, who is like a sister, and her friend Benjamin. What Phoebe doesn't know is that Mallory is really a faerie, sent to Phoebe to collect a debt that the Rothschild family owes, dating back generations to when her ancestor Mayer Rothschild made a bargain with the Faerie Queen for his extraordinary sons. When the Faerie Queen suspects that Mallory isn't doing her job well, she sends Ryland, Mallory's brother, to help her collect it. He forces the situation to light and causes Phoebe to decide if she is another extraordinary Rothschild, or just an ordinary girl. Nancy Werlin has created a magical read in Extraordinary with a great blend of history, enchantment, and love. Phoebe is a loyal, kind character and while she may have a hard time classifying herself as anything but ordinary, it's obvious to the reader that she is special in the way that she cares for Mallory before they become friends and in her generosity. Their friendship isn't as prominent in the story, but instead the book really focuses on how Phoebe is forced to examine her own self worth through her new relationship with Ryland and her struggles with Mallory and her lies. There are quite a few moments when the reader is forced to think on what it means to be extraordinary, to the world and to those you love, and Werlin offers some keen insights on both. Phoebe eventually finds herself confronting the faeries in a battle of wits, and it is refreshing to find that Werlin's faeries aren't completely infallible as other stories and books make them out to be. 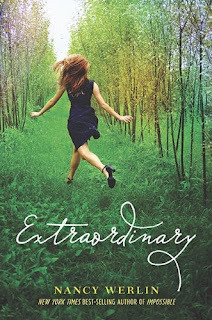 While not quite as romantic as Impossible , Extraordinary is a thoughtful, clever, and unique book with plenty of suspense and a few twists that will leave you contemplating the meaning of both the words “ordinary” and “extraordinary”. Cover Comments: Such a gorgeous cover! I love all of the color and the vibrancy of the background, and how the picture depicts the girl caught mid-step, making her seem really light and airy, which is quite fitting for the cover. This is a beautiful, beautiful cover, and I love everything about it. Extraordinary will be released on September 7th, 2010. Great Review! Now I'm left wanting to reading the even more than I did before. I cannot wait to read Extraordinary. Its so odd to see my name (Mallory) being written in a review. Opps let me rephrase that. Now I'm left wanting to read the book even more than I did before. I didn't realize it was about faeries! Awesome review. I loved Impossible by Nancy Werlin. I honestly didn't know this book had come out, so I am glad I saw your review! I've been too busy getting ready for school, and my book search has suffered. Again, great job. The lovely cover is definitely what first attracted me to this one! I enjoyed many parts of it, but I found it to be a little slow.